See 'More Info' for condition information on this stunning rarity. The front laminated image is clear and clean, with just a little fading towards the very edge of the spine; aside from a little laminate lift along the bottom edge, the laminate is still fast, with almost no creasing. There is a little corner rubbing and the edges are still sharp with just one small scuff on the bottom and a small nick in the spine, leaving all the text legible. The reverse has some light age discolouration with the text all remaining clear; the previous owner's name is discreetly written on the bottom. The flipbacks are secure and the sleeve is free from tears or splits. 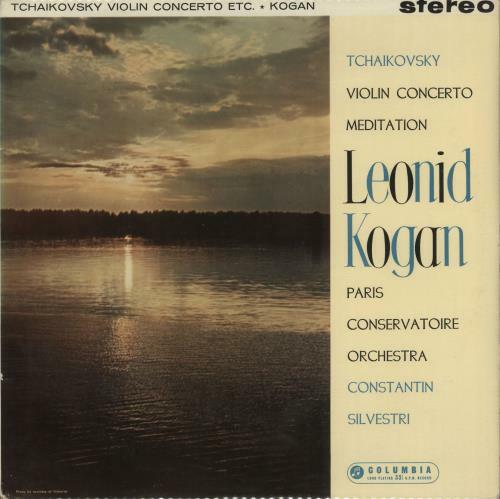 Product Information Leonid Kogan Tchaikovsky: Violin Concerto / Meditation - 1st (SAX 2323) UK vinyl LP album (LP record).